This powerful Progen 52cc petrol strimmer offers high-quality performance with easy usability, making a fine choice for anyone seeking a reliable strimmer for outdoor maintenance. With a two-stroke air cooling 52cc petrol engine, this strimmer has more than enough power to cut away even the coarsest growth. Whether you have an overgrown garden, large amounts of land that need maintained, or require a strimmer for your work, there’s no task this product can’t handle. The bump feed spool allows for easy strimming in gardens of varying condition, offering enough power to easily take down thick growths of grass and weeds. When it comes to tougher plant growth such as a brambles or dense shrubberies, then simply attach the brush cutter attachment and enjoy the impressive results. A total weight of 7.5kg makes handling the strimmer much easier, and it’s certainly noteworthy when you consider how heavy strimmers with similar sized engines can be. The split shaft design means you can easily transport and handle the strimmer, and the double handle also helps with balance and manoeuvrability. Better still, a harness is included with the strimmer, so by attaching it to your body you can expect it to be much lighter and easier to use - no need to worry about strains or fatigue when strimming for long periods! A free tool kit is also included, making it much easier to assemble and maintain the strimmer as you use it. Instructions are also included, and it’s a great reference point if you are unsure about anything, such as the right fuel mixture, how to assemble, and general care and maintenance for the strimmer. 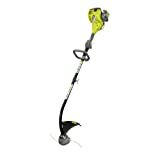 For such a great price, you will struggle to find more reliable petrol strimmer that offer such impressive cutting power. The Parker Brand 52CC is a powerful petrol strimmer and brush cutter combination that is perfect for heavy-duty maintenance in the garden and on the go. Powered by 1 cylinder, 2-stroke air-cooled 52cc petrol engine, this robust strimmer will make short work of even the toughest grass and weeds. For example, the twin line bump feed spool offers a quality line capable of long grass and weeds, especially in overgrown gardens that require that bit more power than a standard mower or strimmer. The bump feed design ensures efficient line usage, and should you require something for overgrown bushes and the like, then the separate three blade brush cutter attachment comes in very handy. While this petrol strimmer is certainly a great fit for garden maintenance, it’s also a fine option for any professionals seeking a comprehensive strimmer for their work duties. Better still, the strimmer comes with a host of extras that many will appreciate. For instance, if you’re concerned about the strimmer weighing too much and tiring you out, then the inclusion of a support harness should ease these concerns. 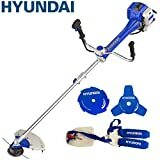 This may be necessary for some users, as the strimmer is on the heavier side, weighing 8kg without any fuel. There is also a tool kit included to help with assembly - which is a straight-forward process - as well as maintaining the strimmer as you use it. While a fuel mixing bottle allows for safe, hassle-free refuelling. Also, the petrol strimmer comes with an in-depth user manual that makes operating the machine much easier. It offers tips on operate both the strimmer and brush cutter heads, as well as how to start the engine, assembly instructions, and maintenance advice. All of this is available for a very competitive price! This trimmer is excellent for garden edges and underbrush. The pros of this product include that it is well built with a good weight balance ratio, and it works without much vibration. The power on it is great enough to get difficult hedge areas. Another pro is it’s D shaped handle that is easy to start and easy to hold. The product comes with the trimmer, the reel with a 6m line for cutting, 1 wrench, and an instruction manual. This makes a comprehensive set up process that is easy to put together. The product is 4.3 kg, which is more lightweight than the other products mentioned, and it has dimensions of 92.4 x 24.4 x 24.4 cm. The con of this product is that it can take a few pulls to get started. Once it is started, the product does a good job. This product is right for you if you have thick hedges in your garden to trim due to it being lightweight and easy to lift, with enough power to get through thick branches. Overall, petrol strimmers are very useful for maintaining, creating, and detailing a beautiful English garden. Having a tool like this is paramount for getting the idea clean cut gardening look. The three recommendations above were the best we found on the market and by reading the reviews, you can choose the most appropriate one for your gardening needs! Weighing in at only 3.9kg, the trimmer is not heavy making it perfect for most users. 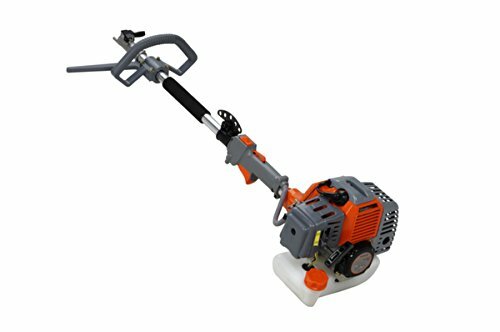 The model is a petrol loop handle grass trimmer, which is ideal for home owners or small businesses alike. The curved shaft has been intelligently designed to allow for a comfortable position to work from while trimming such things as lawn edges and flower beds. The model also comes with a “Tap n Go” line feed. Operating under a simple process, tapping the head of the trimmer on the ground will release the cord. This excellent feature gives you fast and precise cord feeding, as well as a shaft comprised of two parts for easy compaction, transportation and storage. For ease of use, the trimmer also has a manual pump for the carburettor which means you can start the trimmer quickly and without hassle. Overall, the TrimMac is a well built model with a design that confirms its exceptional durability, with the capacity to last many years if cared for properly. The 0.6kW engine coupled with the 41cm cutting width means that you’ll always have perfect control over your trimmer, allowing for a superior trim every time. The features like the “Tap n Go” feed and the curved handle all contribute towards the high quality that this product brings, making it great for any home and any trimming task. The Hyundai 51cc 2-Stroke Anti-Vibration Petrol Grass Trimmer/Strimmer is a fantastic dual function machine of high quality, with many features to offer. The cutter is powered by the Hyundai 50.8cc two-stroke high torque low emission petrol engine, and is powerful enough to handle bigger tasks that smaller competitors may struggle with. The engine has an excellent mid range torque so you can power through heavy undergrowth without the need for maximum revs, lowering the impact on the environment. 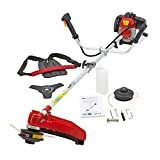 This product is fantastic for cutting and trimming tough weeds, brambles and overgrown grass, with its versatility making it useable in both the home and at work. Intelligently designed with a fully enclosed anti-vibration system and handles positioned relative to the shaft means that there’s less stress placed upon your arms and back, which makes the model ideal for extended use. Weighing in at 9.68kg, this is a cutter that can cope with the heavy duty tasks but still be lightweight enough to operate comfortably. The fully padded ergonomic harness helps spread the load, and the right hand grip contains the on/off switch, throttle control and safety trigger. This means you always have a precise, safe and easy control of the cutter at all times. Overall, the model is a great piece of kit that gives a quiet yet efficient trim every time, with a design that minimises engine consumption yet maximises efficiency. Suitable for both family usage and for a professional gardener, this is sure to impress. 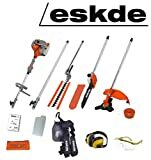 The eSkde 52cc Petrol Brushcutter/Strimmer/Hedge Trimmer/Chainsaw 5in1 Multi Tool is a versatile, efficient tool that provides great coverage for a variety of gardening tasks. The model is equipped with different attachments which can be easily rotated around depending on need. The multi tool contains a Brushcutter, chainsaw, hedge trimmer and a strimmer, meaning you can tackle a wider variety of tasks without the need to constantly swap out tools. The model also comes with a 1m extension pole, so high reaching branches and other similar things are easily accessible. The 50cc stroke petrol engine unit gives you the power needed to accomplish all your tasks with ease, and the 1.2 litre fuel tank means you can work for a good length of time without needing to stop and refuel constantly. Weighing in at 5.9kg, the brushcutter is lightweight and manoeuvrable, giving you a precise and responsive control over your multi tool at all times. The design is durable and hard wearing, making it perfect for heavy duty tasks as well as smaller ones. All the other attachments are built to the same standard, a sign that the entire model was designed intelligently. Overall, the 5 in 1 multi tool is a well built, versatile technology, with all the different attachments allowing for easy movement between tasks. The intelligent yet simple design means that anyone can easily pick up and begin using the model right out of the box, and with all its features, there’s something you can use for most tasks. 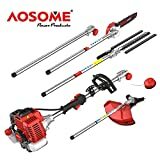 The AOSOME 52cc Petrol Multi Function Garden Tool is a great example of a versatile gardening tool that can perform a variety of tasks. The model comes with four attachments and an extension pole to enable the high hanging branches or hedges to be reached. The multi tool offers a chainsaw, strimmer, brush cutter and a hedge trimmer. 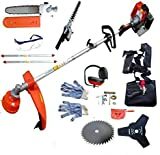 With all these functions many tasks are accomplishable, such as maintaining grassy edges with the strimmer, trimming brushes and roots with the brush cutter, pruning hedges and bushes with the hedge trimmer and even sorting out thick and tough branches with the chainsaw attachment. The 52cc engine means you have enough power to accomplish the tasks you need, and the 1.2 litre engine means you can work for extended periods of time without the need to stop and refuel. The model also comes with extras such as ear and eye protectors, a toolkit, gloves and a belt and shoulder strap to distribute the weight of the tool more evenly across your body should you need it. Overall, this is a versatile and durable piece of kit, cleverly designed and well built to ensure maximum efficiency. The wide range of attachments mean you can rotate between tasks with ease and not have to constantly worry about carrying large quantities of tools around. This also cuts down on the amount of maintenance, only needing one tool not 5 different ones. A great model, designed to be easily operated by anyone and with a high level of precision and safety, so the risk of accidents is minimised. This is a powerful strimmer with a 33 cc engine. 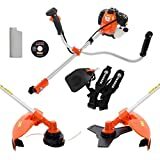 This is probably one of the most versatile strimmers on the market, being able to tackle a variety of gardening issues such as tough weeds and bushes. This strimmer is best suited to small to mid sized gardens. The best thing about this strimmer is that it has been designed for ergonomic use, spreading the load across the harness and tool to ensure comfort of use and injury prevention upon moments of prolonged gardening use. This strimmer is known for it's easy assembly and prompt delivery. The specifications include: 33 cc engine, 2 stroke engine, centrifugal clutch, one cylinder cooling system, 2 cycle petrol engine, gas mix ration of 1:25, 1.2 horsepower, 7kg in weight, and fuel tank capacity of 0.8L. This product comes with its parts and an instruction manual for assembly. Another pro about this product is that if spare parts are needed, they are readily available and can be ordered in. The cons of this product include the fact that it is not as suitable for larger gardening work as it is for small to medium gardens, it has less horsepower than the first product, and the instruction manual can be a little bit difficult to follow. If you are looking for a strimmer for your small to mid sized garden, this petrol strimmer is a good product for you. Petrol strimmers are very efficient when it comes to cutting longer grass and tough weeds. Much more powerful than a conventional electric strimmer, most petrol strimmers also double as a brush cutter for cutting away woodier plants and weeds, such as brambles. Also, being petrol powered makes the strimmer completely mobile, making especially handy for using away from the home and in very large garden areas. Even a cordless strimmer needs its battery recharged after a short while, making petrol strimmers one of the best options for using on the go - even a small amount of petrol can power the strimmer for a fair amount of time. However, there are some potential setbacks when buying a petrol strimmer. For instance, they can be rather heavy, making them difficult to operate for some, while the fumes, noise, and vibrations may be off putting to others. Perhaps the most important thing to consider for a petrol strimmer is how easy it is to use. As they feature a combustion engine and much more robust components than electric models, a petrol strimmer can feel rather cumbersome to use. They do have the feel and versatility of many garden multi tools. They can be quite heavy, while a range of handle and shaft designs are also available, so you want to look for a model that has the level of usability for your needs. As they feature a robust combustion engine, petrol strimmers have significantly more power than most other types of strimmers. Engine sizes are measured in cc, so the larger the cc the more power the strimmer provides. You will want a petrol strimmer that is powerful enough for your needs. For example, if you need to cut back thick patches of long grass then look for engines above 32cc, while anything smaller should be fine for less strenuous maintenance. Petrol strimmers are naturally heavier than their electric counterparts, namely due to their engine design and heavy-duty features like cutting blades and thick shafts. Thankfully, many manufacturers design their petrol strimmers to be more lightweight, which is certainly useful for anyone that struggles with heavy objects. However, some of the more robust petrol strimmers are still heavy, so be sure to consider how much weight you can handle and how long you will be using it for each time. Some heavier models come with features like harnesses for easier use, while certain attachments may increase the weight too. The shaft of a petrol strimmer is typically straight, curved, or split. These designs offer their own benefits for different forms of maintenance, so think about how you will be using the strimmer. For example, curved shafts make strimming large arears more comfortable, while straight shafts tend to be less comfortable but offer much more cutting power. Split shafts are great for multi-purpose maintenance, as they are designed to work with various attachments such as a brush cutter or hedge trimmer. Often referred to as the cutting path, the cutting width of a strimmer will impact its suitability for certain tasks. For example, those with larger cutting widths can cut a much bigger area in less time, while smaller cutting widths are perfect for light duty work around the garden. While you certainly want enough cutting width to make the job as easy as possible, be sure to avoid buying a strimmer with an unnecessarily large cutting width - you only need it for heavy-duty work in large areas. Most modern petrol strimmers offer a range of features for various forms of maintenance. For instance, many come with various attachments, allowing users to cut back various types of growth, ranging from grass to bushes. Others include carrying harnesses to make handling the strimmer easier, while some come with adjustable shafts, maintenance tools, fuel mixing kits etc. So, be sure to check out any additional features and whether they may be useful for your needs. There are three main line feeds found on petrol strimmers - bump feed, fixed head feed, and automatic feed. While each of their own pros and cons, bump feed is widely viewed as the best type thanks to its speed and efficiency. With bump feeds, you simply bump the base of the strimmer to release the line, while automatic feeds do so without prompting. However, automatics can be unreliable unless featured in high-end models which utilise better technology. These two feeds require spooling before use, but fixed heads mean you need to introduce a new line any time the previous one breaks, which is obviously quite a nuisance as you need to stop mid-strimming. For this reason, it’s best to look for automatic or bump feed lines in a petrol strimmer. Which is the Best Petrol Strimmer?